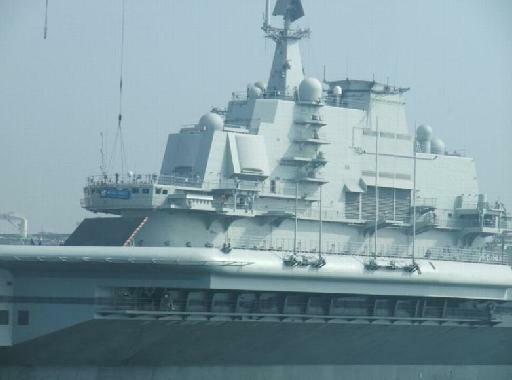 China will name its first aircraft carrier "Liaoning" in honor of the province where it was retrofitted, the Southern Metropolitan Daily reported, citing an authoritative source. The paper confirmed that officials decided to name the carrier to commend the province where it was renovated and repaired, thus Liaoning. A file photo of China's first aircraft carrier before painting. The carrier, often referred to by its original name Varyag, is a retired Soviet-era vessel that China bought from Ukraine in the late 1990s. The carrier was later harbored in Dalian, Liaoning Province, where it was retrofitted. The vessel began sea trails in August 2011 and on September 3 received the side designation "16," prompting speculation that the vessel had completed basic trails and would soon be commissioned. The carrier's name has been a topic of interest for some time, and many netizens opined that it was likely to be named after Shi Lang, a well-known general during the Qing Dynasty, or the former leader Mao Zedong, or even the capital city of Beijing. However, according to Chinese naval designation regulations, vessels can only be named after provinces, cities, counties, mountains or lakes, and not people. China will officially announce the name of the vessel after it has been commissioned. China will name its first aircraft carrier "Liaoning" in honor of the province where it was retrofitted, the Southern Metropolitan Daily reported.